Pono Burger chef/owner Makani Carzino's Makani is open. The Venice restaurant features seasonally driven fare from chef Kevin Lee and rum-centric cocktails. Makani, 512 Rose Ave., Venice, CA 90291, 424-645-5410. 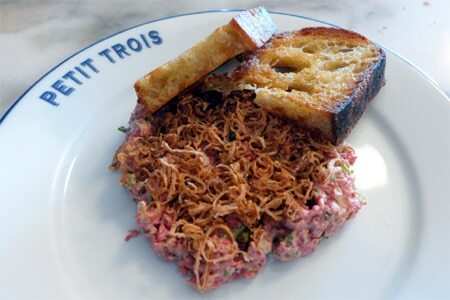 Chef Ludo Lefebvre has expanded his culty strip mall bistro Petit Trois into a much larger sister location in Sherman Oaks. Petit Trois la vallée features many of Lefebvre’s popular dishes plus some new menu items, as well as a full bar. Petit Trois la vallée, 13705 Ventura Blvd., Sherman Oaks, CA 91423, 818-989-2600. Halo Top Scoop Shop is open in the Westfield Century City mall. Look for stevia-sweetened scoop and soft serve ice cream with flavors ranging from classic vanilla, chocolate and strawberry to pistachio and red velvet. The new location is debuting its “Stardust Sundae” which features vanilla bean soft serve with holographic sugar-free vanilla sauce, cosmic star sprinkles and a geode crystal candy inside a waffle cone. Halo Top Scoop Shop, Westfield Century City, 10250 Santa Monica Blvd., Los Angeles, CA 90067, no phone. DTLA complex The Bloc has added Hatch Yakitori + Bar to its collection of shops and eateries. The sprawling space features pale pine furniture, airy windows and patio seating. Chef Daniel Shemtob (winner of The Great Food Truck Race) offers up yakitori grilled on binchōtan charcoal including chicken with plum, beef with shiso, and seared ahi; he also has a specialty “black menu” with black fried rice, black ramen and black karaage. Hatch Yakitori + Bar, The Bloc, 700 W. 7th St., Ste. G600, Los Angeles, CA 90017, 213-282-9070. Ari Taymor’s (Alma) weekend brunch pop-up project Little Prince in Santa Monica has made renovations that welcomed a permanent menu and dinner service Monday through Saturday. Expect seasonal farmer’s market-focused dishes in Taymor’s contemporary style, and a cocktail and wine list. Little Prince, 2424 Main St., Santa Monica, CA 90405, no phone. Ori Menashe and Genevieve Gergis have followed up their hit Italian spot Bestia with Bavel, a Middle Eastern restaurant also located in downtown LA's Arts District. Bavel, 500 Matteo St., Los Angeles, CA 90013, 213-232-4966. K-town restaurateurs Jonathan Whitener and Lien Ta (Here’s Looking At You) are opening another likely-hipsterish eatery in Silver Lake later this year called All Day Baby. It will take over the space of now-shuttered Samosa House. Look for a New American menu with global influences for breakfast, lunch and dinner, alongside wine and craft cocktails. All Day Baby, 3200 Sunset Blvd., Los Angeles, CA 90026, no phone. One of New York City’s most famous “speakeasy” cocktail bars, Employees Only, now has a location in West Hollywood. Look for a sultry, Deco-inspired interior, with a bar, dining room and back room. Chef Sascha Lyon (Balthazar) creates a luxe menu featuring bone marrow poppers, seared foie gras, bacon-wrapped lamb chops, rillettes of duck, rabbit and pork, and pan-roasted halibut. A wood-fired pizza oven also turns out lighter fare. Employees Only, 7953 Santa Monica Blvd., West Hollywood, CA 90046, 323-536-9045. In East Hollywood, new confectionary Le Bon Garçon is serving up handmade artisan caramel made in the French tradition. Look for flavors including salted caramel, honey-lavender caramel and orange mimosa caramel. Le Bon Garçon, 5158 Hollywood Blvd., Los Angeles, CA 90027, no phone. In Hollywood’s Franklin Village, La Villita Cantina has opened in the former home of local icon Victor’s Square Restaurant. The old Jewish deli vibe has morphed into a rustic Mexican neighborhood spot with bright tiles, wood chandeliers, spacious booths and a lounge with tequila cocktails. La Villita Cantina, 1917 N. Bronson Ave., Los Angeles, CA 90068, 323-460-2200. Stuff'd Dumpling Shop on Melrose Avenue offers a menu focused on Eastern European-style dumplings with contemporary global flavors, like Siberian (beef and pork), Kalua pig (with cabbage and purple potato purée) or misoyaki cod (in bacon dashi broth, with pickled shiitake mushrooms and baby bok choy). They are also gluten-free, organic and made with locally sourced ingredients wherever possible. Lunch & Dinner daily. Stuff'd Dumpling Shop, 6909 Melrose Ave., Los Angeles, CA 90038, 323-424-7148. 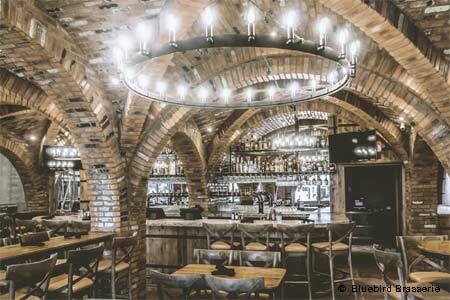 Sherman Oaks welcomes the stylish new Bluebird Brasserie, specializing in Belgian ales, brewed in-house and imported, on 16 taps and from a lengthy bottle list. 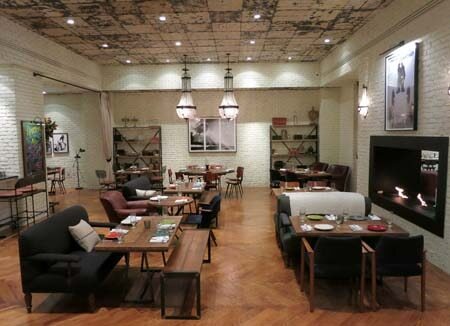 Décor includes plenty of wood, arched brick ceilings, and a huge, rough-hewn granite bar beneath atmospheric lighting. The Belgian-styled brasserie menu features traditional Belgian meatballs with mashed vegetables and leek relish, four versions of moules frites, a roasted half chicken, cassoulet and steak frites. Dinner nightly. Bluebird Brasserie, 13730 Ventura Blvd., Sherman Oaks, CA 91423, 818-849-6970. Piencone Pizzeria, Creamery and Pub has opened in Eagle Rock, with something for everyone. Look for artisan pizzas made with naturally fermented dough including the “Vegan Squashington” with kabocha, rosemary, garlic confit, goosefoot greens, charred shallot and almond ricotta. A selection of wood-fired small plates highlights wild boar-stuffed arancini with lemon Parmesan sauce, and sugar snap peas with smoked ricotta and pickled rhubarb. Lunch & Dinner daily. Piencone, 1958 Colorado Blvd., Los Angeles, CA 90041, 323-274-4728. Yardbird Southern Table & Bar is now open in the reimagined Beverly Center mall. As with its other locations in Miami Beach, Las Vegas and Singapore, the classic Southern cooking includes chicken ‘n’ watermelon ‘n’ waffles, deviled eggs, and house-made buttermilk biscuits. Yardbird Southern Table & Bar, Beverly Center, 8500 Beverly Blvd., Los Angeles, CA 90048, 323-250-8034. BBQ author/expert Adam Perry Lang (Daisy May’s BBQ USA, NYC) has opened a luxe steakhouse in Hollywood called APL Restaurant. The focus is on dry-aged steak from a variety of carefully sourced Midwestern beef. Look for the famous Texas-style BBQ at lunch, available only as grab and go from a window, but expect some sophisticated French-leaning dishes beyond beef at dinner as well --- after all, Lang also trained at Guy Savoy in Paris and Daniel in NYC. APL Restaurant, Taft Building, 1680 N. Vine St., Los Angeles, CA 90028, 323-416-1280. Jessica Koslow (Sqirl) will open a spacious new full-service restaurant just west of the 405 on Barrington this year named Tel. 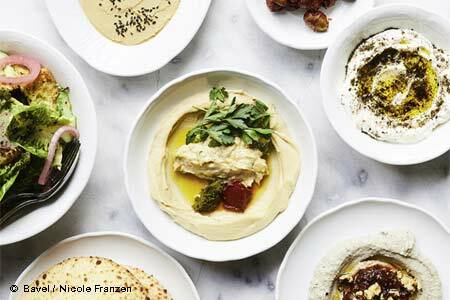 Look for a focus on global Jewish cuisine. Menu items might include some standout dishes she’s recently cooked at pop-ups, including quail shwarma, smoked fried Jerusalem artichokes with fried citrus and black garlic aïoli, sturgeon with hulba and green sahawek, and malabi with Persian mulberry jam and turmeric millet jack. Tel, 2231 S. Barrington Ave., Los Angeles, CA 90064, no phone. In West Hollywood, the glamorous La Bohème will flip into a new upscale steakhouse called LB 66. Renovations should start in early 2019 with a possible June or July debut. Look forward to aged steaks and chandeliers. La Bohème, 8400 Santa Monica Blvd., West Hollywood, CA 90069, 323-848-2360. Chef Jordan Kahn’s fine dining destination in Culver City, Vespertine, is adding a new day of service, along with earlier hours. Sunday seatings for the full tasting menu will begin at 3:30 p.m., with the last reservation at 7:30 p.m. Vespertine, 3599 Hayden Ave., Culver City, CA 90232, 323-320-4023. Burbank’s hilltop steakhouse restaurant The Castaway has re-opened following extensive renovations. Look for refreshed banquet rooms and a new, expanded patio offering a view. The Castaway, 1250 E. Harvard Rd., Burbank, CA 91501, 818-848-6691. Chef Kris Tominaga (The Hart & the Hunter, Cadet, Mardi) will now be helming the stoves at Manuela in DTLA. Look for some menu changes in the months to come. Manuela, Hauser Wirth & Schimmel, 907 E. Third St., Los Angeles, CA 90013, 323-849-0480. Italian chef/restaurateur Stefano Ongaro (All' Angelo, DOMA) is now executive chef/general manager at Second Floor Restaurant Bar & Grill, an Italian restaurant in Koreatown. Former DOMA chef de cuisine Steven John Short is also on board. Second Floor Restaurant Bar & Grill, 865 S. Vermont Ave., Los Angeles, CA 90005, 213-388-3880. Chef Michael Voltaggio’s ink.well on La Cienega Boulevard has shuttered. ink.well, 826 N. La Cienega Blvd., Los Angeles, CA 90069, no phone. "Top Chef" alum Katsuji Tanabe has shuttered his popular eatery Mexikosher on Pico Boulevard, although anyone heading to New York City can still grab a tasty Kosher Mexican taco or burrito at his Upper East Side location. Mexikosher, 8832 W. Pico Blvd., Los Angeles, CA 90035, no phone. Modern Mexican chef Maycoll Calderón’s first LA restaurant, the chic Tintorera, has closed in Silver Lake after less than a year in business. Tintorera, 2815 Sunset Blvd., Los Angeles, CA 90026, no phone. The Church Key in West Hollywood has reportedly shut its doors. We enjoyed the creative modern American fare from chef Ryan Ososky, so we'll look forward to his next project. 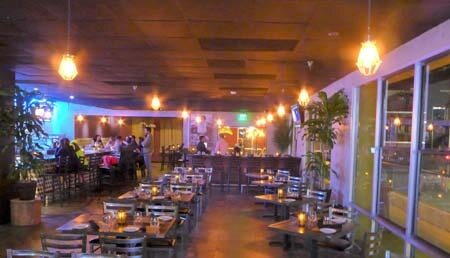 The Church Key, 8730 Sunset Blvd., West Hollywood, CA 90069, 424-249-3700.